The last time my phone fell into water, it was a toilet and it came out just fine. An ice fisherman in the Russian city Yakutsk ended up dropping his iPhone 7 Plus into the very fishing hole he was utilizing over the weekend. Because he wasn’t able to just reach down into the water to get the phone back, it had to sit where it had fallen overnight until the fisherman could enlist a friend of the fishing locales could dive down and fish the phone out. 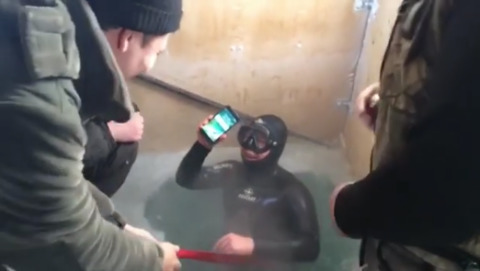 The diver, Fedor, posted video of the attempts on his Instagram account, where he had explained it took all of three attempts to fish the iPhone out from where it had fallen under the ice-cold water. When it was finally retrieved from the fishing hole, the iPhone turned on with no trouble at all. It wasn’t even damaged from either the fall or the 13 hours of being underwater in 39.2 F water, which is an impressive feat to say the least. According to the ice fisherman, the phone had about 35 percent of its battery left, and when it was retrieved and powered back on it had about 19 percent battery left to go. The iPhone 7 Plus isn’t even really rated as a waterproof device, though it has water resistance. The fact that it survived this kind of treatment is especially impressive, however, so if you end up dropping your phone in the toilet like I managed to do a year or two ago you should be fine, though I wouldn’t advise dropping your phone into water like this even if it can take it.